Touring the Mount Baker Highway is an extraordinary day trip packed with breathtaking scenery. Officially, it is both a Washington State Scenic Highway and a National Forest Scenic Byway. The route follows Highway 542 from Bellingham, passing through farmland and forest before winding its way up to Artist Point at 5100 feet. Most of the route (116 miles round trip) is open year-round, taking you as far up as the Mount Baker Ski Area. Views of the Nooksack River Valley, Mount Baker-Snoqualmie National Forest, and the peaks of the North Cascade Mountain Range can be enjoyed during winter and summer. Some of the most gorgeous and memorable scenery is located past the ski area where the road is only open during the warm months. The very best vistas and hikes along the Mount Baker Highway are at Heather Meadows and Artist Point. Planning your trip in August or September allows you to take full advantage of the stunning and colorful scenery. Late September and early October bring a bit of fall color. Be prepared with a full tank of gas. There are no services such as food, gas, or flushing toilets beyond the town of Glacier at Mile 33, so be sure to bring snacks and plenty of water. Choose your trails carefully if you have a dog. Dogs on leashes are permitted on most, but not all, trails. A recreation pass is required. If you don't have the appropriate annual pass, you can purchase a day-use pass at the Glacier Public Service Center, located at Mile 34. Open seasonally, this official Mount Baker-Snoqualmie National Forest station is the place to talk to expert rangers about current trail and road conditions, to get maps and guidebooks, and to purchase recreation passes. And there are bathrooms! This is the last public restroom along the highway with flush toilets, so take advantage of this opportunity. It is also the last place to fill your water bottles. A short drive off the main highway along Wells Creek Road (a well-maintained dirt road) takes you to the viewing area for this charming misty waterfall. For much of the year, this extremely photogenic little lake is as far as you can travel along the Mount Baker Highway. The road circles the lake, as does a flat and accessible half-mile trail. From the trail (or your parking spot) you can enjoy an amazing view of Mt. Shuksan, made all the more lovely reflected in the still lake. While the visitor center is charming and historic, it's the surrounding scenery, including Table Mountain and Bagley Lakes, that make this stop a must-see. You can explore the area on the easy Fire & Ice Trail, the moderate Bagley Lakes Trail, or the more ambitious Chain Lakes loop. After you've wound your way up Mount Baker Highway, all the gorgeous mountain scenery comes to an extraordinary climax at Artist Point. 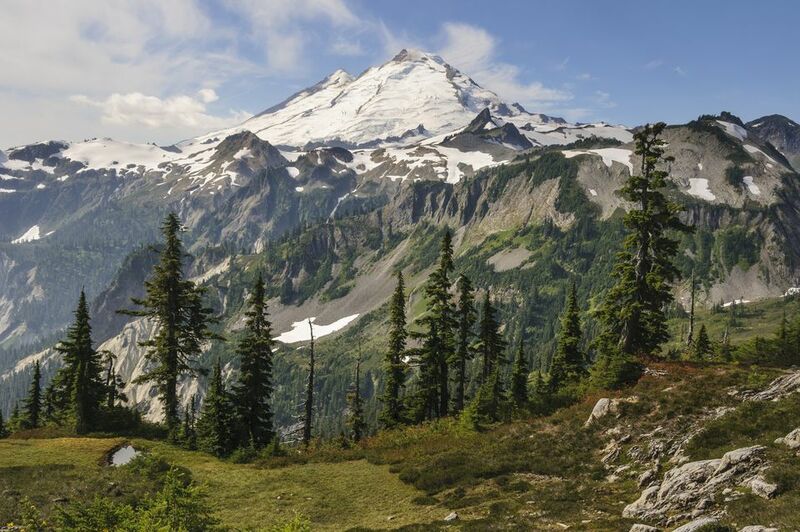 A short hike takes you to grand views of Mount Baker itself, the volcanic peak to the southwest of Artist Point. You don't even have to leave the parking lot to take in the breathtaking sight of Mt. Shuksan and the North Cascade Range. Hiking trails, including the short Artist Ridge trail, allow you to savor the views in all directions. One of the things that makes a Mount Baker Highway day trip so enjoyable is that's it's easy to break up the "road" part with time on nature trails or short day hikes. Maps and details for these hikes and more can be found at Mount Baker-Snoqualmie National Forest website. Don't forget to ask about current trail conditions at the Glacier Public Service Center. Be sure and plan extra time for these challenging hikes. While the distances don't seem long, for the average hiker, the terrain may slow you down. And then, of course, there are the stop-worthy views. This "beer shrine," pizzeria, and wedding chapel offers microbrews crafted on-site as well as tasty pizza, calzones, grinders, and salads. Under new ownership since 2011, Grahams Restaurant in Glacier continues to offer burgers, beer, and other house specialties. This family-run restaurant features fresh and authentic Italian cuisine as well as deli-style sandwiches and desserts. Their Foriana pasta dish, with anchovies and raisins, is a unique and tasty dish.